Wow ! That is exciting news and to be able to love on your grandsons will be a blessing and a true new chapter in your life. 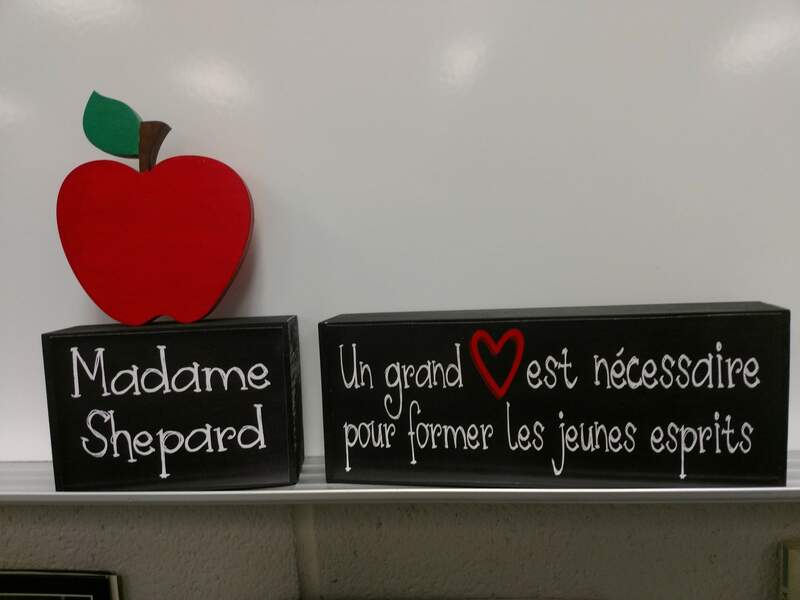 You have been a tremendous inspiration to all of us as French language teachers. The amount of energy and hard work and dedication you put into your work is truly amazing and sooo very much appreciated to us that you share it all with us!! I hope to see you at some PD workshops! I’d love to attend! Bon Courage et merci pour tout! I thank you so much for sharing your work and I am sorry I have taken time to express my gratitude before. I am writing also to wish you all the best in the new departure. I’m sad to have just discovered your blog but happy it will continue. Can you give me advice on how to manage a combo French III, French IV, French IV AP class? We use DF and Thèmes. Also, I cannot find how to access your unit lessons. Hi, Susan I have been most successful by teaching combined classes together. I have found that there are a wide variety of proficiency levels and some IIIs might be stronger than some IVs. This will, of course, require you to have an A year curriculum and a B year curriculum. To access the lessons you can choose the relevant level from the menu on the left and scroll through the posts until you find one that interests you. Then if you read the post there should be links to an agenda for the unit to which the resources are linked. Let me know if you have any questions! Bonne chance. Vous m’avez donné beaucoup d’inspiration! Et j’adore les signes! Félicitations pour les petits-enfants qui ont bien de la chance de vous avoir dans leurs vies! Bonne continuation dans vos nouveaux projets. Bonne chance! Merci pour le partage de tous les leçons et les idées. C’était fantastique! I wish you all the best and thank you for your contributions to the World Languages community. Bonne chance! You have been such an inspiration to so many of us and have been so generous to share your materials for many years. Your knowledge of the proficiency-based world is amazing, as is the quality of your work. I’ll continue to be a big fan and thank you again for everything! 1) if I save a copy of one of your google slide documents (unit agendas), will the links within them also stop working after a certain date? Should I go within them and save all of those as well? 2) I really want your thoughts on curriculum. In my school we have worked hard to create a new curriculum over the past couple of years, following ACTFL The Keys, etc. It’s been good and i feel the students can certainly do much more than what they could in year’s past without performance based practice and assessments. BUT… here’s the big question I have: we have now seemed to completely pigeon hole our curriculum into FOUR super strict units per year, per level. Basically, we “think” we’ve gotten it down to a “science” of a uber-organized system of learning. As a result, I find, it has left us with very little wiggle room and/or freedom in the classroom to teach what’s current, or what we’re passionate about! This leaves zero time for a fun, quick 3-day unit on noël, say; or an 8-day unit on the November terrorist attacks when they occurred or elections when they come up! What are your thoughts on that? my gut tells me that, as teachers, we should seek out units we’re passionate about creating and that are (obviously) appropriately targeted to the level we’re teaching. And of course, if preferred, we could stick to the “established curriculum” but shouldn’t their be a balance? How do you propose having the best of both worlds? thank you so much! I’d be so grateful for your insight. ?!?!?!?!! SPELLING ERROR in my post up there 🙂 “…shouldn’t THERE be a balance…”?!? Thank you for the prompt reply! I have been saving lots of resources using “new link”, so will check back periodically as you update. Thanks again – so grateful for all you share. On the other question – I do think we all would probably appreciate and benefit from knowing we have flexibility in curriculum. It’s really no different than a district-adopted textbook, where teachers use, lose, tweak, curriculum within. Ultimately I think we all want what’s most effective and engaging for students as well as what’s most fulfilling and inspiring for the teachers. Another shout out of gratitude to you, on this note – for sharing the limitless range of topics for possible units for the study of Francophone cultures! I am so happy for you and so sad for us! You have been an inspiration in my teaching career! Enjoy your grandsons! I cannot thank you enough for the AMAZING blog and work that you have done! You have made me a better teacher. I am in awe with your ability to make some wonderful, wonderful units. Your generosity is greatly appreciated!! I wish you all the best as you enter this new phase in your life with your family and your business. Please do continue your work. I love your ideas and insights. I reitred once and now back to teaching at age 67. But I think next year may be my last. I applaud you for starting a business of your own. Bon courage. Look forward to hearing from you next year. I will have a challenging year with French 4 and would appreciate help from you. I am definitely keeping my options and might end up back in the classroom at some point. Let me know how I can help with your 4s! Félicitations et bonne chance dans ce nouveau chapitre! J’ajoute mes sincères remerciements pour votre généreux partage et fantastique inspiration que vous nous avez donnés…je vous suis, comme beaucoup, éternellement reconnaissante pour les heures de recherche épargnées, le trésor de leçons et activités que présente votre blog! Je me languis de voir vos nouvelles trouvailles et idées, et continuerai à vous suivre sur ce site! How wonderful! You are such an inspiration to me and I look forward to collaborating with you in the future! Bonne chance et felicitations! Vous avez été une grande source d’inspiration pour moi! How exciting! You work is always an inspiration and I look forward to seeing you at a conference or in another capacity. Félicitations!!!! You have donated so much to the French teaching community with this blog. I can’t thank you enough for all you have shared with the world, and I mean that most sincerely. My goal over the summer is to comb through your blog in its entirety! I will need to copy your many units to make sure I have access to them! Thank you again, and I hope you will consider offering workshops to teachers who want to deepen their teaching for proficiency. I would be the first to sign up! Thank you for your kind words! Feel free to email me at lisashepardwlc@gmail.com if you’d like me to provide a workshop in your area! Merci mille fois pour votre générosité. You have saved my life on many an occasion! Best wishes in your new endeavors. I can only echo the words of those who have already posted. Your work has been such an inspiration to me as a French teacher! Merci encore pour tout ce que vous avez fait pour moi et les autres! I am also working on saving all of your resources! Bon courage for your new chapter and I really hope to attend a workshop with you at some point. Thank you so much for your kind words–I’d love to meet you at a workshop! If your district is interested in professional development, feel free to contact me at shepardwlconsultant.com Have a great summer! I just found this blog last summer through AP training. You have given me materials that were priceless as I strive to create a more authentic class with authentic materials without burning out since I have 5 preps. Your blog and the lessons you have shared have reinvigorated me and my class. Your building blocks have been eye opening and great examples of resources! Thank you! I’m thrilled for you as a grandma myself, I know the joy this phase will bring you! Best wishes!!! 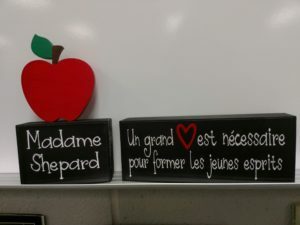 Mme Shepard: I only discovered you last year, but have gained so much in understanding how to construct a good lesson. Thank you so much for your generosity!! I’m so happy you will have time for grandchildren and that you will continue to be involved in the World Language community. Please let us know how we can follow your pursuits from here! I moved to high school French this year after teaching elementary ESL. Your website has been a huge help and inspiration for me this year. Your resources and explanations have helped me become a better teacher. I have used your materials and tried to create others in the same style. As I develop and grow in my teaching I hope to give back to language teachers community the way that you have so generously. Thank you for all you have done to advance the French teaching profession! I truly appreciate all you have done for your students. From your time in Ohio to our school district in Missouri, many kids have felt YOUR appreciation for teaching, learning, and love for the French language. I cannot imagine my sophomore year of French being any different. Of course, there were difficult times and setbacks, but I am so glad you were there with us through it all. I hope your next step in life and beyond goes amazingly well. I cannot thank you enough for all of your hard work and generosity for running this blog. I just finished up my first year teaching, and your units and metacognition in regards to proficiency-based teaching + assessment has helped me grow as an educator. I was feeling completely overwhelmed (for many reasons) at the beginning of the year, but being able to use your units and IPAs as a reference for where I wanted to take my classes was such a lifesaver. Good luck in your next adventure! Thanks Megan and félicitations on finishing your first year. Keep in touch as you continue your work! Thank you so much for you tenure and service to the French teacher community! I personally found your blog recently in my own transition to a proficiency based classroom! I LOVE your resources and especially your IPAs, that is still the tough part for me. I am saving as much as I can and with your permission would love to share this with my colleagues in my District. I would love to request your consulting services in our district for PD on how to write IPAs – this is a huge district focus that we started in February of this past year (2018). Enjoy your grand-babies and again, thank you for this blog! I’m so sorry to read this news as I just discovered your blog this month! 😦 You have done such an amazing job at creating meaningful language acquisition and fun lessons for students. I am in awe of all you have done and how willing you have been to share! It won’t give me access to any student data or records, just the course content. Merci beaucoup! Merci d’avoir eu la bonté de partager avec nous vos lessons. We all really appreciated it. Je vous souhaite beaucoup de success dans vos entreprises. futures. Que le Dieu de Paix soit avec vous. Quick question: Can you send a link of your podcast from last Spring (?) with Laura Terrill? I recall something in there about a recommended timeline of assessments? Am I remembering that correctly? I’d like to listen to it again to clarify my memory! Something about Interpretive: weeks 2-3-4; and Presentational week 3-4? You have been an inspiration to not only your lucky students who have had you as their guide, but also to SO many teachers of world languages as you have mentored us towards more effective proficiency based instruction. Thank you for that and for modeling for us by sharing your materials and hard work! I greatly appreciate your generosity!! I wish you all the best in your “new beginnings” and adventures to come. Thank you for maintaining your helpful site as it is a constant source of resources, insight, ideas, and motivation. Best of luck and thank you again! Wishing you all the best and thank you for all of your lovely lessons! I want to thank you so much for all of the wonderful work that you have shared very generously. I’ve learned a lot from you and continue to be inspired by your work. While I’m sad that you have left teaching (perhaps selfishly on my part), I hope you are enjoying your new role in education – the students are lucky to have you in any capacity!!! Thank you so much for leaving such a kind comment! I am very much enjoying my semi-retirement. I love working with language teachers around the country, and am also finding time to spend with my grandsons. I’m grateful every minute to be doing what I’m doing! Bonjour Madame! I hope you’re enjoying your retraite, although I’m sure you’re still working on something or other. I am writing to inquire whether you have comprehension questions for the reading “Pourquoi les enfants sont-ils stressés?” from 1Jour1Actu, and the video from Kazados TV entitled “Le Stress des examens.” I clicked on the links in your agendas but no luck. Thank you for your time. Here’s a link to the questions for the article: https://docs.google.com/document/d/17378xleOf8rhf7XhoKfdgO4ABc5mIZvFgStKIF_VCiU/edit?usp=sharing As for the video, we watched it as a class and I paused the video and asked impromptu questions–I don’t have anything written down. Chère Madame: You are amazing and inspiring!. Thank you for responding so quickly. You have opened my eyes to so much and I am so excited to be teaching and mentoring others for my last 7-8 years until I retire myself. Any chance you’ll be at ACTFL in New Orleans this November? I wish but I moved back to OH last week and just can’t swing the trip this year. I will be at Central States in March, though! Probably won’t be at Central States — traveling with students to Paris in April — but if you are ever in Chicago, I’d love to buy you dinner. Or hopefully we can meet at an ACTFL or AATF in the future. I know that you are consulting now, and I’d love to explore the possibility of you doing a PD at our school in 2019-20. I’ll stay in touch. Until then, merci infiniment! I’ll look forward to that dinner, meeting at a conference and/or providing PD at your school!